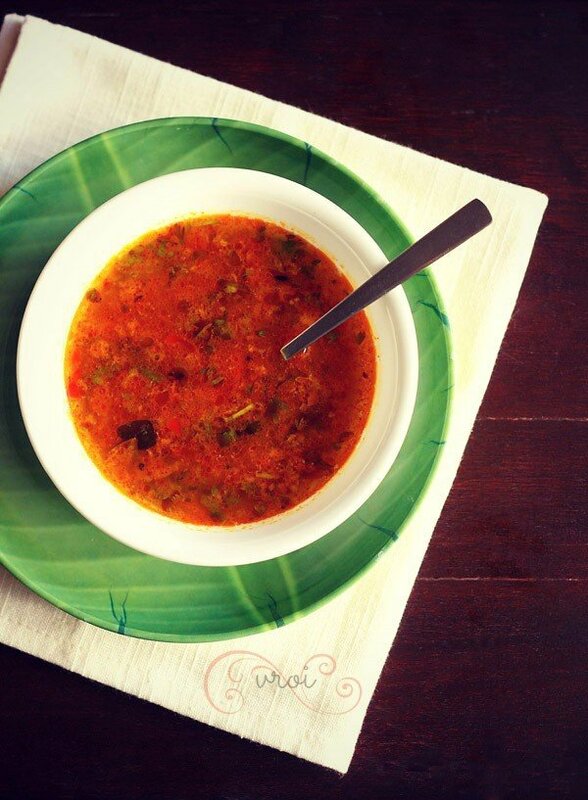 katachi amti - thin spicy dal made from the strained stock of cooked chana dal/bengal gram. katachi amti is usually served with puran poli but also can be served with steamed rice. 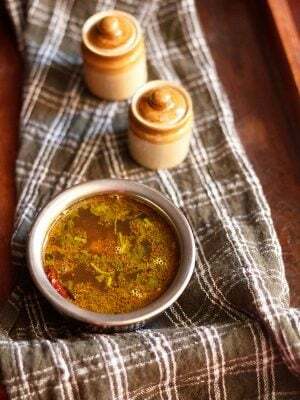 katachi amti recipe with step by step photos. 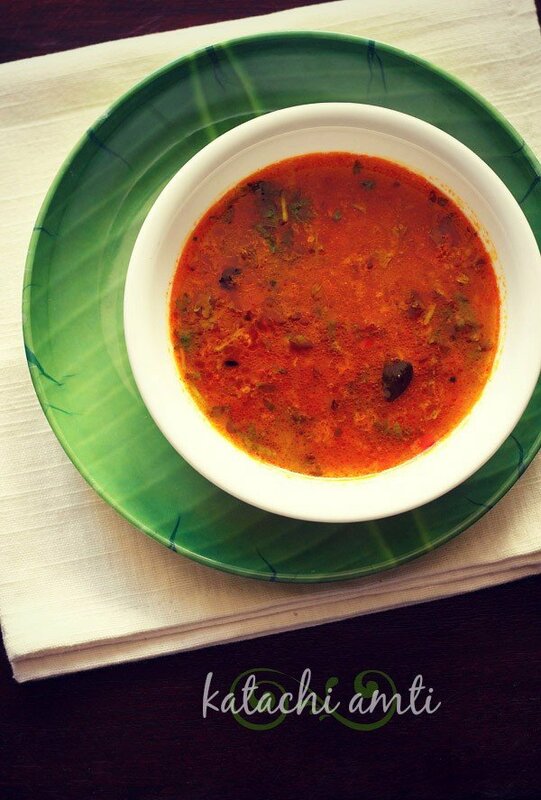 katachi amti is a thin tangy tempered spicy dal from the maharashtrian cuisine. recently when i had made puran poli, i also made katachi amti. 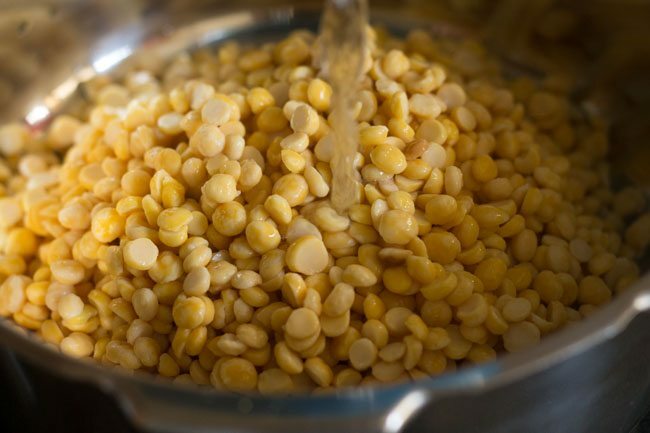 for the sweet stuffing of puran poli or bobbatlu, chana dal is cooked. 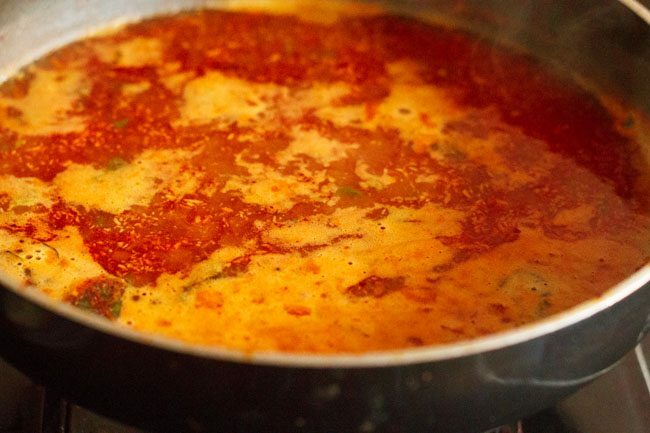 the stock that is strained from the cooked chana dal (bengal gram) is used in preparing katachi amti. 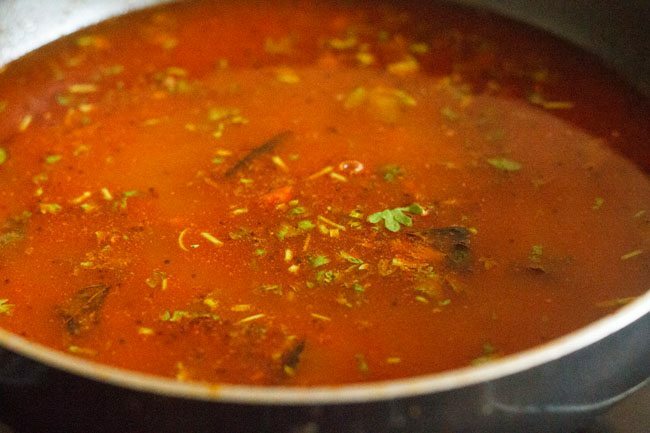 in fact whenever you cook chana dal to make dry stuffings like in kachories or aloo tikkis or even for chana dal kababs, you can strain the stock and make katachi amti. 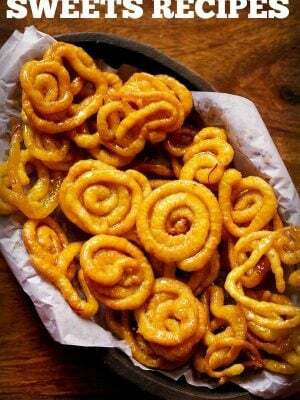 the katachi amti recipe was shared by my maharashtrian friend. its one easy amti recipe. 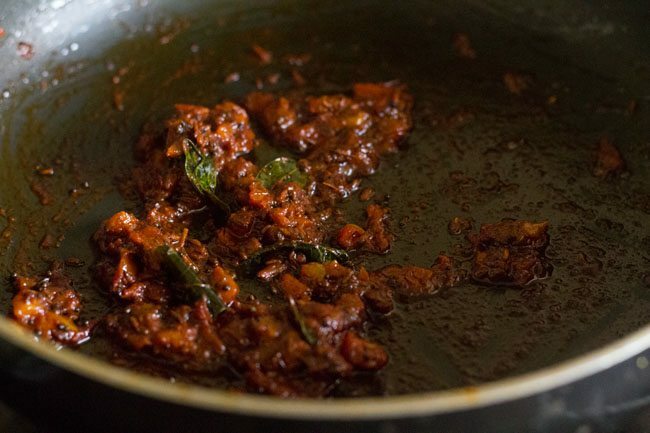 there is no grinding of any spice or masala and even coconut in this recipe. you will need goda masala to make this amti. but in the absence of goda masala, even garam masala is fine or you can skip it. but remember the taste with garam masala will be different. this is also a no onion no garlic recipe. 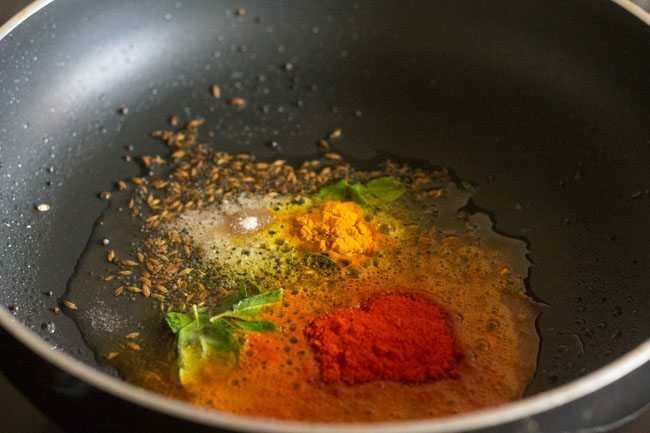 another unique point in this katachi amti recipe is that tamarind is not added. the slight tang comes from the tomatoes. 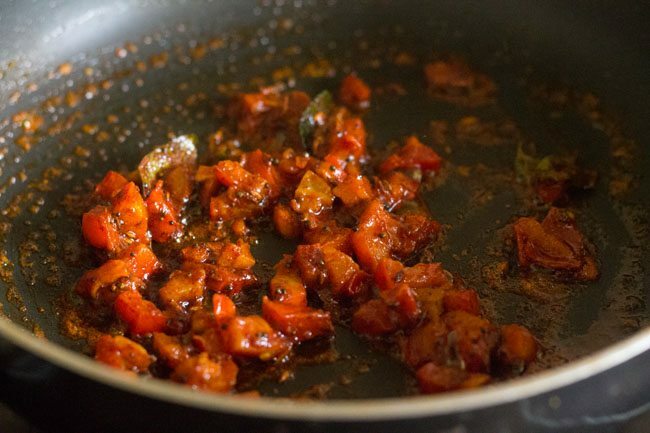 tomatoes are added as there is no spice paste in this recipe. tomatoes also give a mild tang or sourness than tamarind. here, i have not added jaggery, but for a slight sweet taste you can add jaggery. katachi amti is usually served with puran poli. 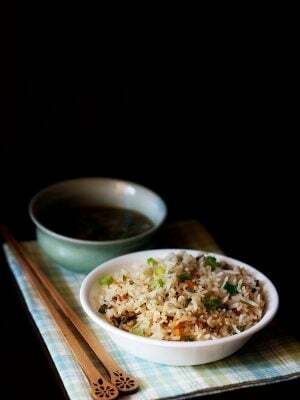 it also goes well with steamed rice. 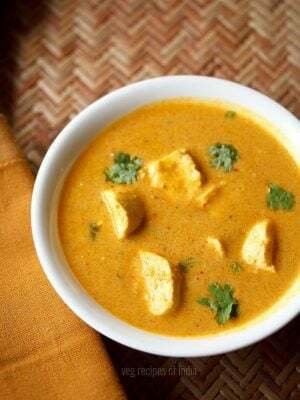 if you are interested then you can also check the following amti recipes – amti dal, peanut amti, matki amti and kala vatana amti. 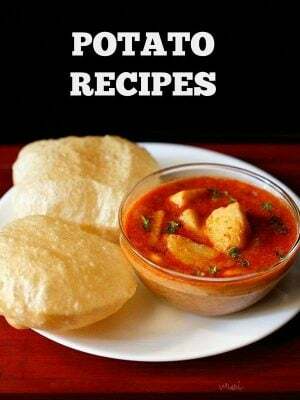 if you are looking for more maharashrian recipes then do check karanji, masala bhaat, kanda batata poha, val usal and usal recipe. 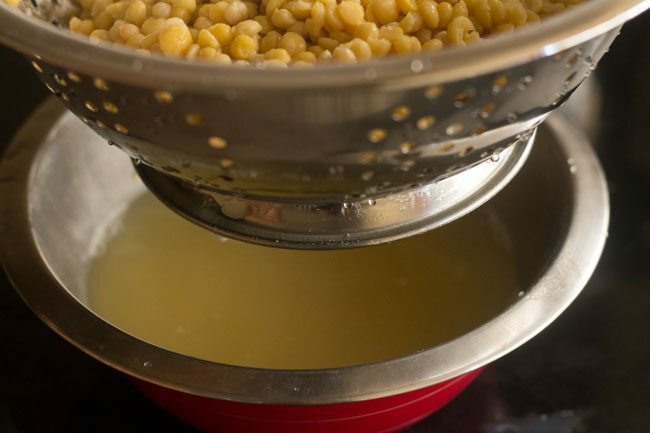 rinse the chana dal first very well in water. soak the chana dal for 1 to 2 hours and then drain the water. 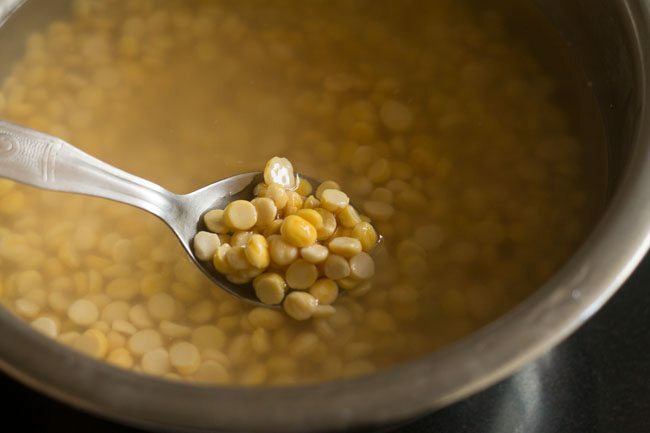 in a pressure cooker, cook the chana dal for 6 to 7 whistles. 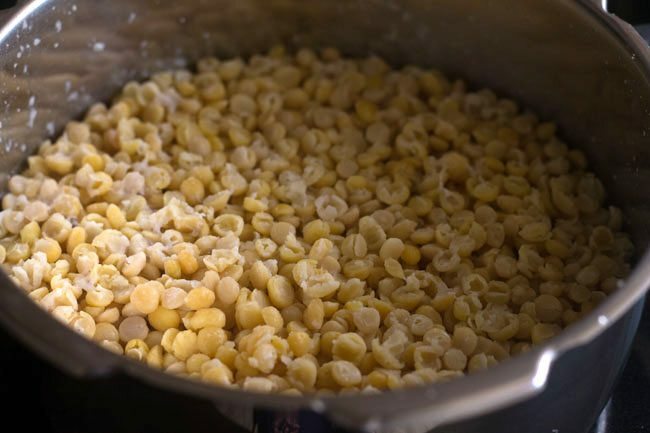 if you soak the chana dal, the cooking time will be reduced. 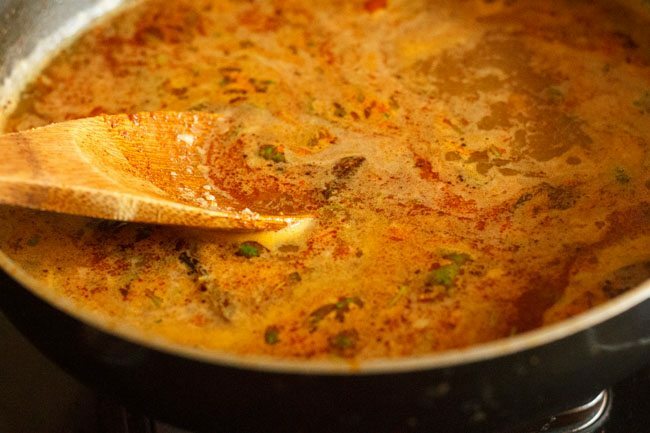 once the pressure settles down on its own, strain the cooked dal. the dal has to be strained well. 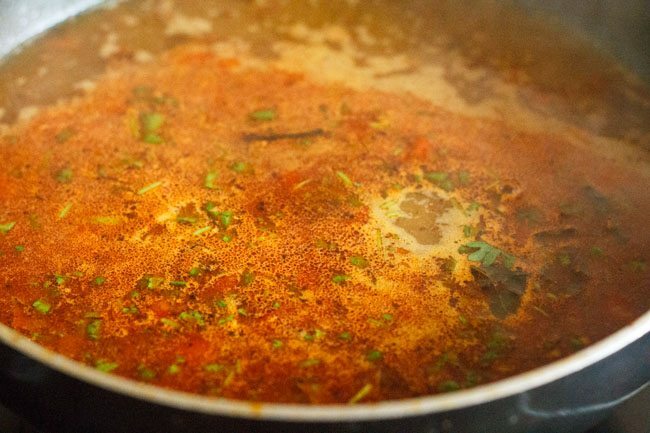 use the the stock to make the katachi amti. also reserve about 2 tbsp of the cooked chana dal. the remaining chana dal can be used to make the puran poli stuffing. in a pan heat oil. first crackle the mustard seeds. 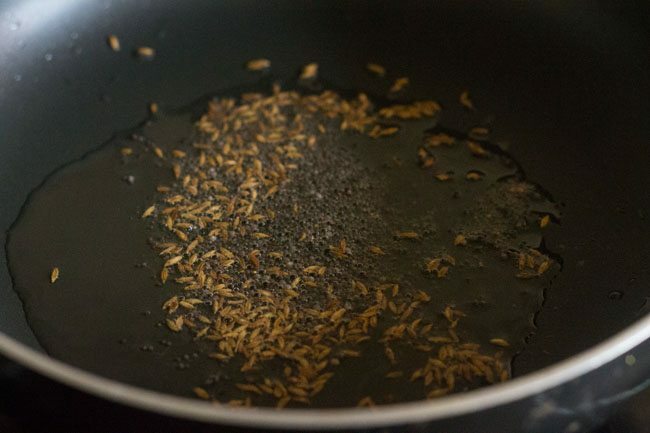 then add the cumin seeds and saute till they change color and are fragrant. then add the curry leaves, turmeric powder, chilli powder and asafoetida. stir and add chopped tomatoes. 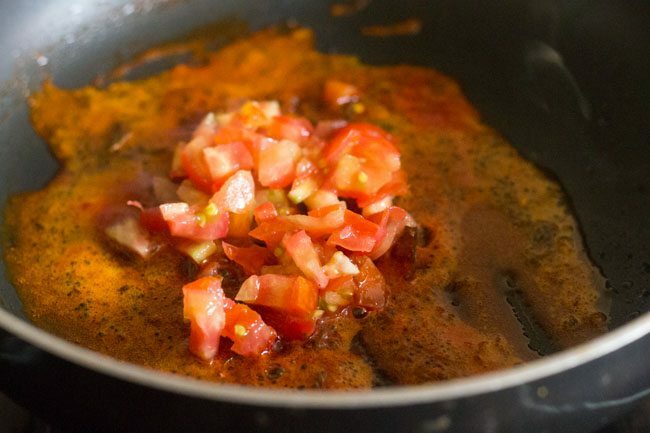 saute till the tomatoes soften. add the 2 tablespoon chana dal and the stock. you can add more water if required. season with salt, chopped coriander leaves and add the goda masala. stir well and let the katachi amti come to a boil. if adding coconut, then you can add now. lower the flame and then simmer amti for some minutes, about 5 to 7 minutes. serve katachi amti with puran poli or steamed rice. 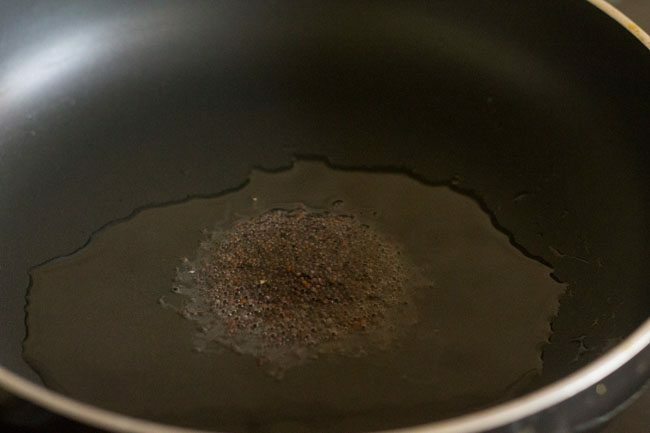 1. rinse 1 cup chana dal (bengal gram) very well in water. 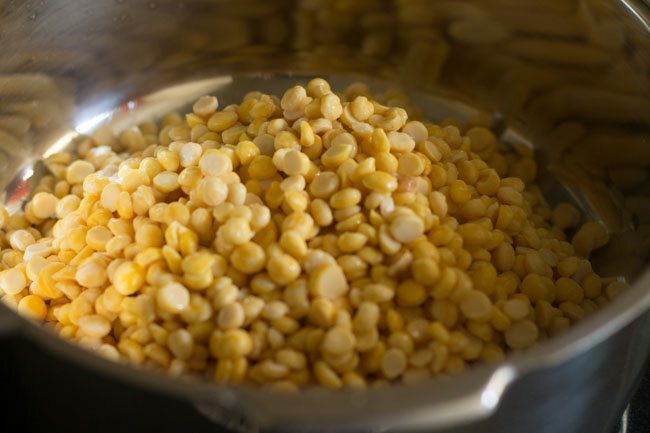 2. then soak the chana dal in enough water for 1 to 2 hours. 3. later drain the water. 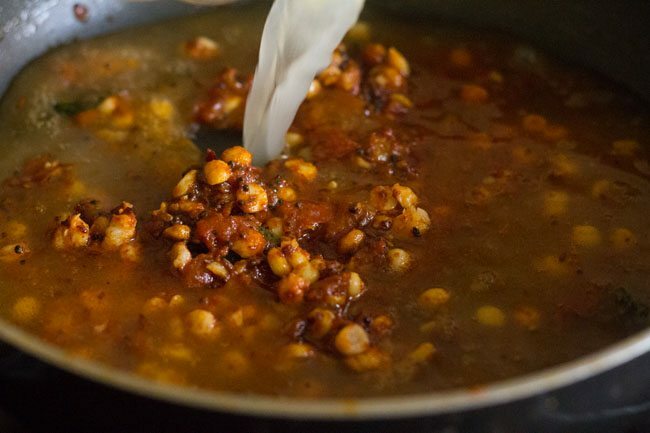 if you don’t have time then you can skip soaking chana dal. 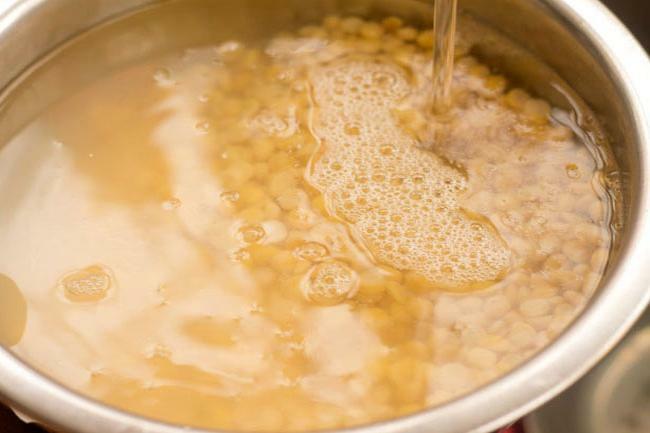 4. in a pressure cooker, add the soaked chana dal. 5. pour 3 cups water. 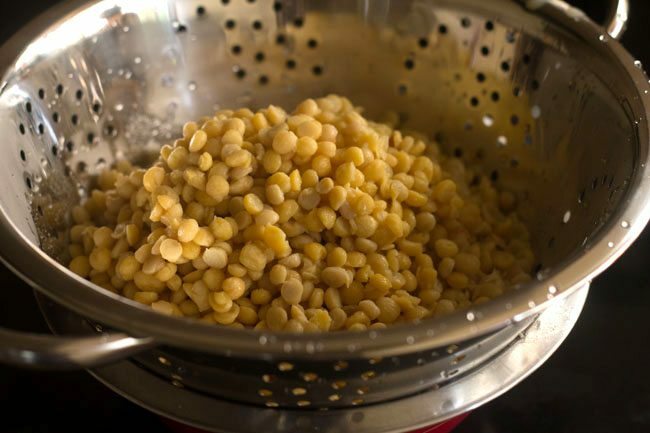 6. cook the chana dal for 6 to 7 whistles or till they are softened and cooked. 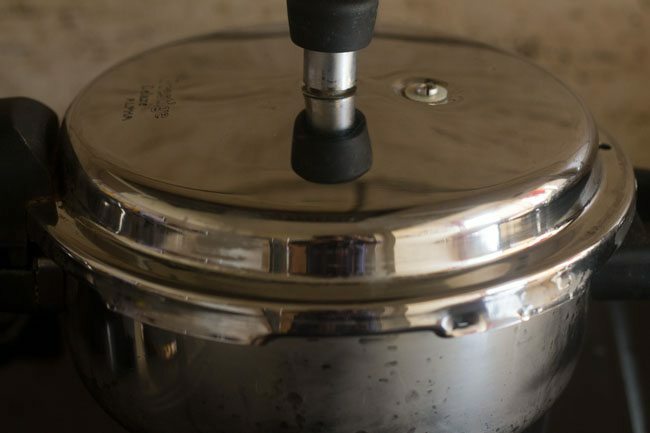 7. once the pressure settles down on its own, then open the pressure cooker. 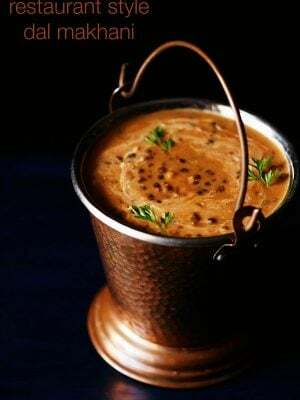 8. strain the cooked dal. the dal has to be strained well. you can use a colander to strain the dal. 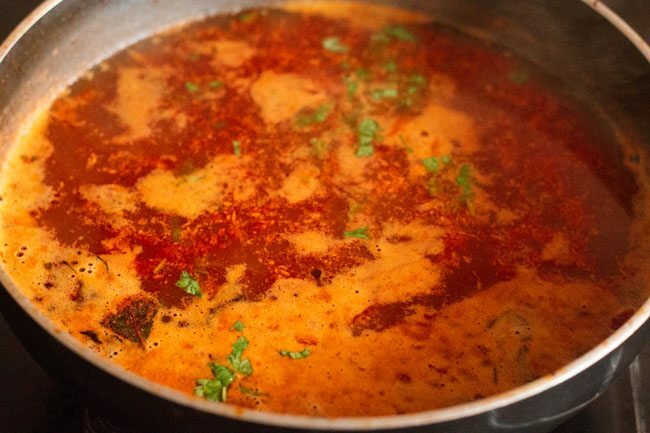 9. use the stock to make the katachi amti. reserve 2 tablespoon of the cooked chana dal. 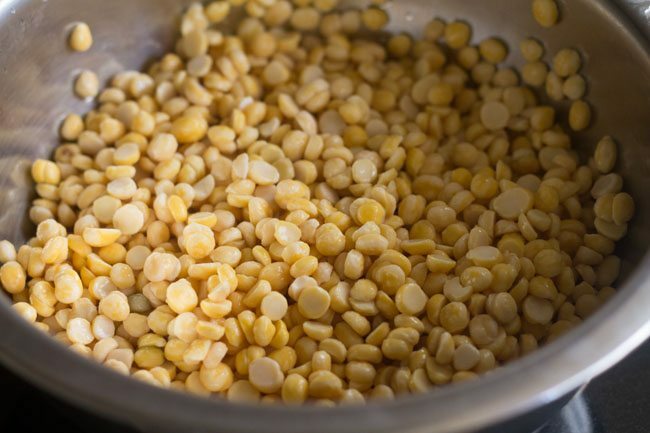 the remaining chana dal is used to make bobbatlu or puran poli stuffing. you can also make chana dal sundal or chana dal paratha from the cooked chana dal. 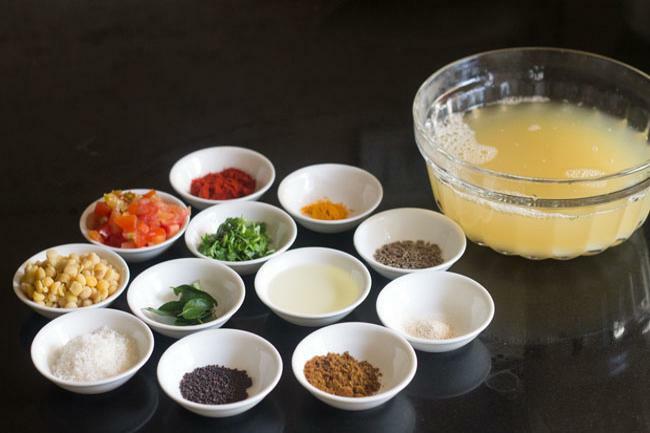 10. measure and keep all the ingredients ready for making katachi amti. 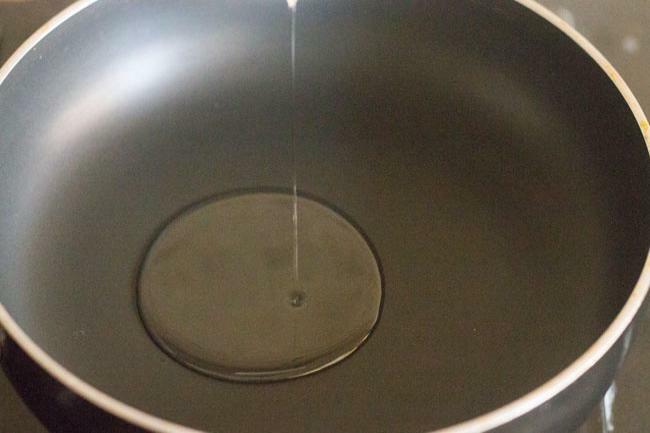 11. in a pan heat 2 teaspoons oil. keep the flame to a low. 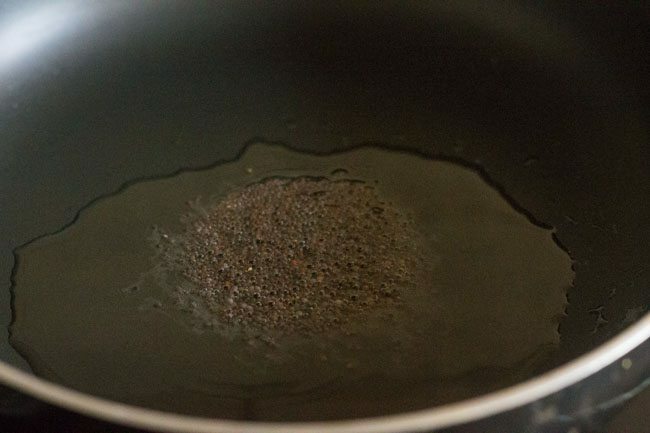 12. first add ½ teaspoon mustard seeds (rai). 13. allow them to crackle. 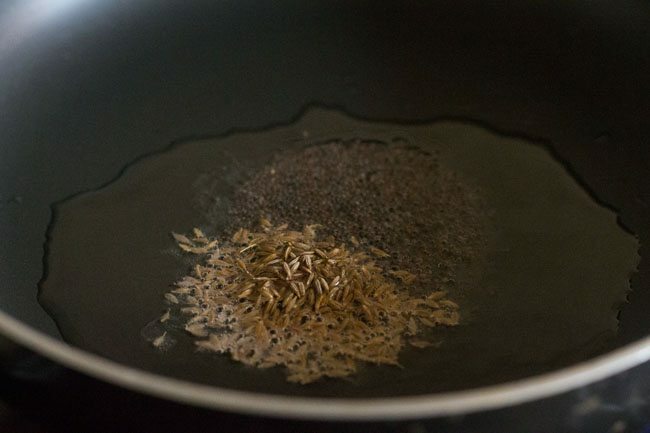 14. then add ½ teaspoon cumin seeds (jeera). 15. saute till they change color and are fragrant. 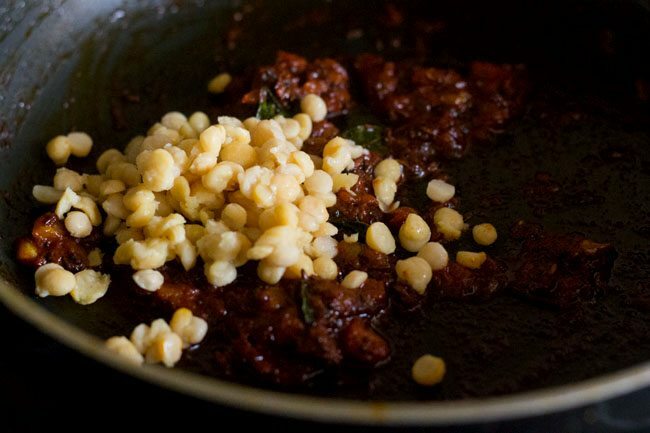 16. then add 5 to 6 curry leaves (kadi patta), ¼ teaspoon turmeric powder (haldi), 1 teaspoon kashmiri red chili powder (or red chilli powder) and 2 pinches asafoetida (hing). 18. then add 1 small tomato (chopped). 20. saute till the tomatoes soften. 21. then add 2 tablespoons of the cooked chana dal which we had reserved. 22. pour all the chana dal stock. you can add more water if required. 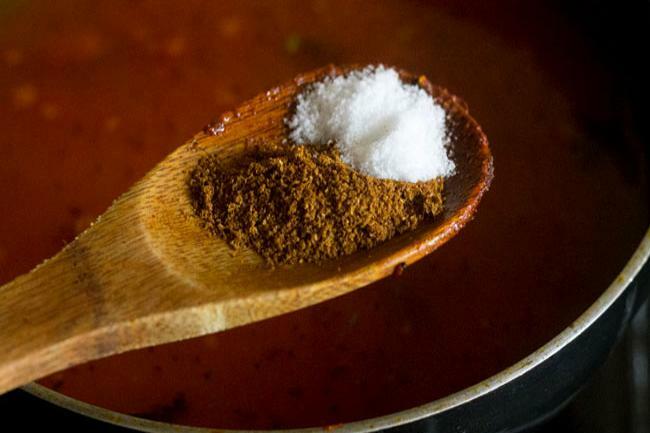 24. add 1 teaspoon goda masala and salt as required. 25. add 1 tablespoon chopped coriander leaves. 27. let the katachi amti come to a boil. 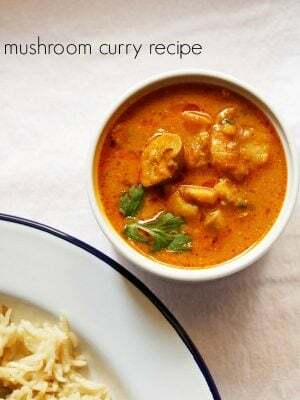 28. if adding coconut, then you can add now. add about 1 to 2 teaspoons grated fresh coconut or desiccated coconut. i used desiccated coconut. 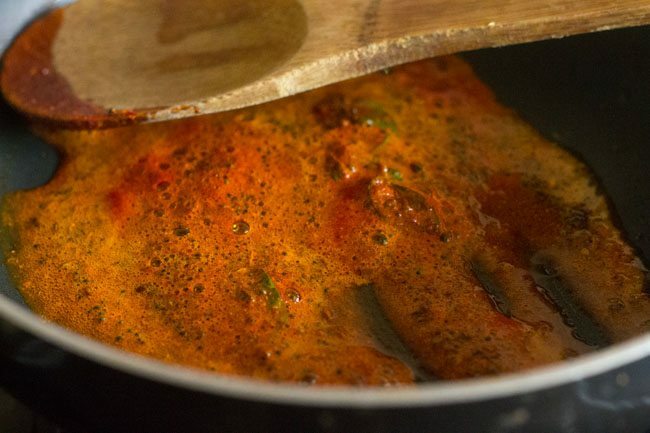 30. lower the flame and then simmer katachi amti for some minutes, about 5 to 7 minutes. 31. garnish with few coriander leaves (optional). 32. serve katachi amti with puran poli or steamed rice. It was sheer coincidence that I read this recipe the day we made puranpoli. LOVED the recipe. Thank you. thankyou so much glad you liked the puran poli recipe 🙂 and you are welcome. You always post nice recipes Dasana.in addition I used concentrated store bought ,which is no mgs version knorr brand veggie broth in the dal and since it is salty ,do not add salt until you taste it , the dal become so tasty……….and yes u do need little bit sweetness and sour taste in it to make it sweet sour hot and salty ( veggie broth) = VERY VERY TASTY . 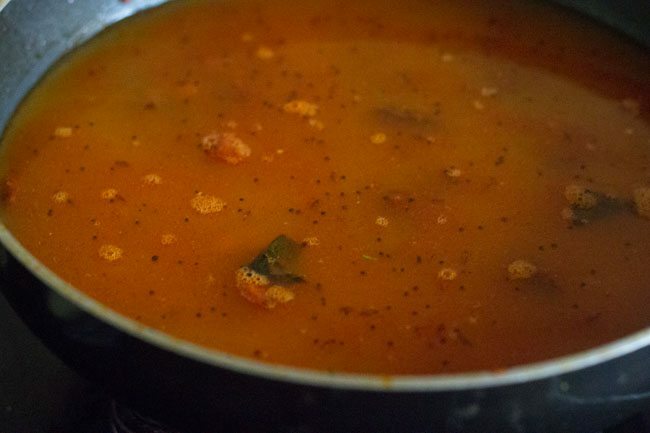 LEFR OVER DALL, next day all kind of veggie you have it ,,make small pieces ,stir fry and cook till it done ,add in your dal with shredded or ground fresh coconut ,if too thick… .boil some water add broth and add in your dal , make tadka again with sambhar tadka ==and you have sambhar with no hard work . 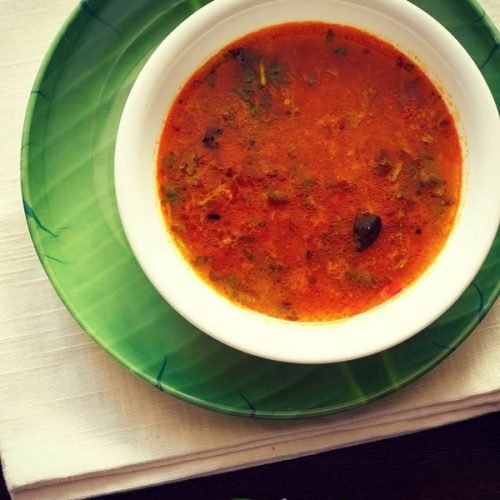 serve with rice ,idli or wheat dalia. thanks hemlata for sharing your experience. 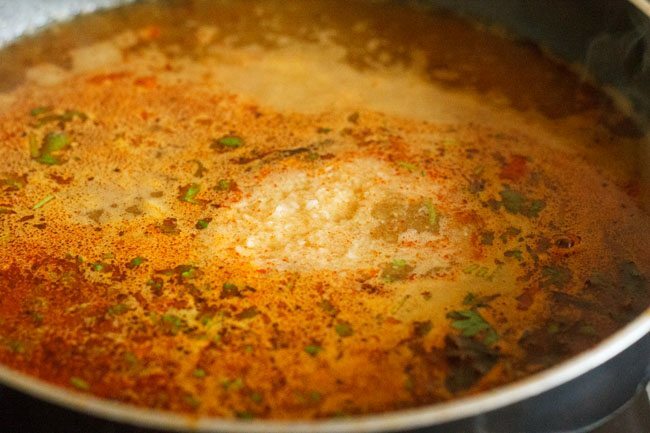 vegetable stock with any dish, will taste good. 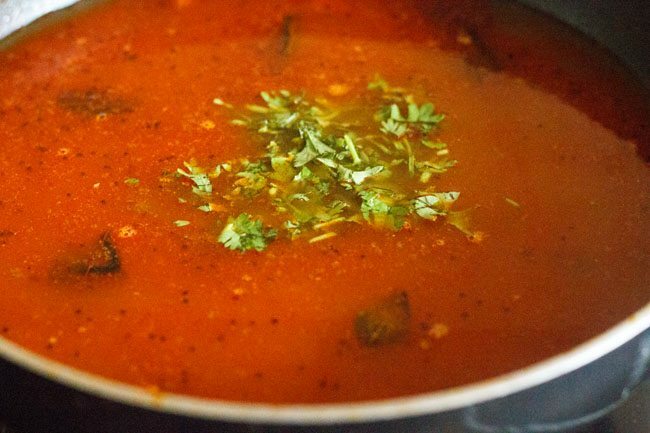 thanks for the tips on making quick sambar too.